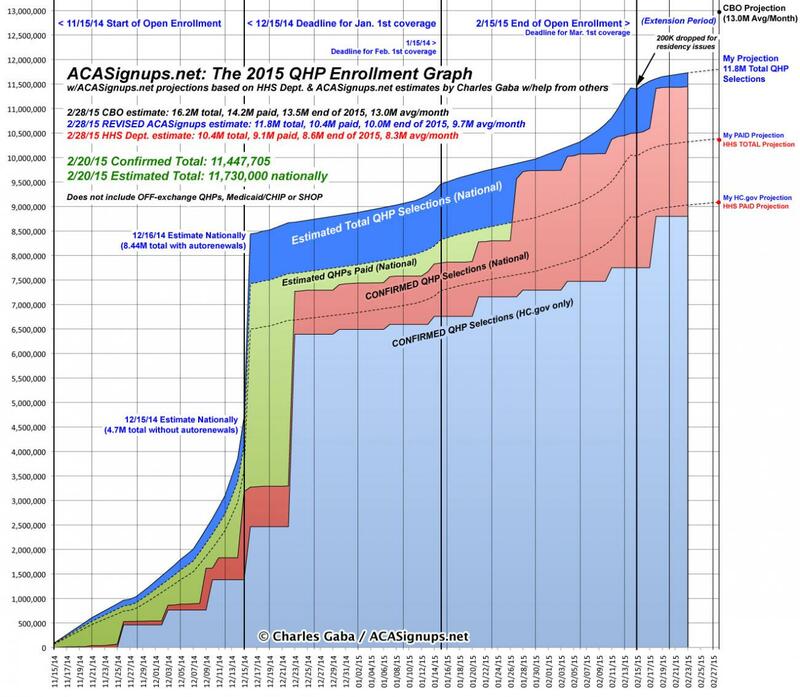 I've already stuck my neck out pretty far by projecting that 2016 Open Enrollment ACA Exchange Qualified Health Plan (QHP) Selections will reach 14.7 Million, which is about 4% higher than the HHS Dept's high-bar estimate (and 33% higher than their low-bar estimate). While I'm at it, I might as well try and project the rate of enrollments. Again, remember that this is not about how many people actually have their enrollment policy effectuated, nor is it about how many are still enrolled at the end of 2016; this is purely about how many select private policies via the ACA exchanges, which is the heart & soul of this website (after all, it's called "ACASignups", not "ACA Effectuated Enrollments at the End of the Calendar Year"). The dramatic vertical spike in mid-December was partly due to the enrollment spike for the 12/15 deadline (in most states) for January coverage, but is mostly due to the bulk auto-renewals of about 3 million people al at once (2.5 million via HealthCare.Gov, plus another half-million or so via various state-based exchanges (SBMs)). After that, there was a very slight jump a week later (several SBMs made 12/23 their January deadline), followed by another "mini-spike" around 1/15 (the deadline for February coverage), and of course a third, more dramatic spike around 2/15, since that was the official deadline for March coverage and the close of Open Enrollment. After that, of course, there was a one-week "Waiting in Line by Midnight" overtime period tacked on for people who had started the enrollment process by 2/15 but hadn't completed it yet for whatever reason. The "true" deadline ended up being 2/22/15 for just about everyone. NOTE: Most states also ended up offering a "Tax Filing Season Special Enrollment Period" (#ACATaxTime) from around 3/15 - 4/30 for people who got caught unawares by the Shared Responsibility Tax Penalty (aka the Individual Mandate) in 2014. This ended up tacking on about 214,000 more QHP selections, which may sound like a lot but isn't, really, considering that 6.6 million households ended up having to pay the tax penalty anyway. The HHS Dept. seemed pretty clear that they won't be offering such an #ACATaxTime SEP a second time, but who the heck knows? The penalty is higher this year ($325 per person or 2% of their taxable income) and jumps even more ($695 or 2.5%) for next year, so we'll see. 1. That my projection for the final total ends up being fairly accurate (whether or not there's any sort of "Standing in Line" period tacked on). Again, I've made my call 14.7 million; the HHS Dept. is being more conservative, with a wide range of 11.0 - 14.1 million. 2. That neither HealthCare.Gov (nor most of the SBMs, especially Covered California) allow a 1-week "Standing in Line" overtime period. They added a 2-week "Overtime" period for 2014 and a 1-week period for 2015. Officially, the deadline will be January 31st this year, but based on the pattern so far I'd say there's a 50-50 chance that they cave in and slap on an extra week once again. To be honest, I think they should make this a permanent policy: You have until midnight on X date to start the process, and up to one week later to complete it. However, the graph below assumes that they don't do this for the 3rd go-around. 3. Related to #2: That there are no significant technical problems this time around. Oh, don't get me wrong; I'm sure there will be issues here and there. I'm talking about major tech meltdowns or outages. Obviously 2015 was vastly improved over 2014 at most of the exchanges, but there were still a few ugly incidents, and both Hawaii and Vermont's systems were still pretty messed up. Hawaii has moved to the Mother Ship, and 3rd time is supposedly the charm for Vermont. 4. That all automatic ("passive") renewals are added on or around 12/16/15. First, Covered California has already started allowing current enrollees to actively renew their policies since October 12th! I have no idea how many of their 1.3 million current enrollees will take them up on this offer, but if it's a substantial number, there could be several hundred thousand people "locked down" on Day One! Of course, even if that's the case, I don't know how CoveredCA will report it; will they start off November 1st with, say, 200,000 already "in the bag"? CMS confirmed Thursday that it has started the process of automatically, or “passively,” reenrolling individuals into exchange plans, in the first of two reenrollment rounds planned for the 2016 coverage year. Last year, CMS conducted only one reenrollment in mid-December, but the agency decided to conduct an earlier wave this year to give issuers more time to prepare reenrollment notices for their customers that include information about federal subsidies, CMS said in an Aug. 25 bulletin. According to the bulletin, most passive renewal transactions will go out in the first wave, which was expected to begin on or around Oct. 15 for the majority of eligible enrollees. CMS did not provide further information on the number of people it expects to reenroll this round. The first batch will not include transactions for enrollees with unexpired 90- or 95-day deadlines to resolve data-matching issues, CMS said. The second wave, expected to start around Dec. 16, will encompass enrollees who began FFM coverage after the first wave of transactions and others who were kept out of the first wave because they needed more time to complete needed actions. Issuers were instructed not to inform consumers that they have been passively reenrolled in order to avoid confusion and give those consumers a chance to actively reenroll, but CMS clarified that insurers can respond to questions about the renewal notices if asked. CMS’ launch of the passive reenrollment also comes on the same day that HHS announced it expects 9.4 million to 11.4 million people to have active exchange coverage by the end of 2016. The department also anticipates customers will choose between 11 million and 14.1 million plan selections in 2016, with 7.3 million to 8.8 million plan selections coming from the reenrollment process. CMS stresses that all people should actively return to the marketplace and shop for plans, since their subsidy levels could change and they may be able to find a better deal. I'm not entirely certain that I understand how this is set to work, but the bottom line is that it sounds as though depending on how HC.gov handles auto renewals, there may be a significant number--several million, perhaps?--who are, again, dropped into the official 2016 renewal tally well before the mid-December deadline for January coverage. I'm sure that a few state exchanges will likely offer some sort of extension/overtime period, and of course after 1/31 you're into off-season SEP enrollments anyway, so there will likely be another 100K or so tacked on from February 1st - 15th, all of whom will also have their policies kick in on March 1st. After that you're into the "normal" off-season period.